Gorillaz is a virtual band created by Damon Albarn of Blur and Jamie Hewlett in Essex, England in 1998. 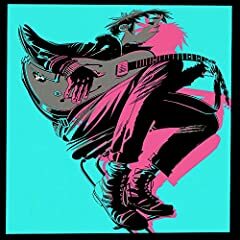 The band has four fictional members: 2D, Murdoc Niccals, Noodle and Russel Hobbs. In actuality, the music is a collaboration between Albarn and other various musicians. Partly because of this, the sound of Gorillaz varies around alternative rock, hip hop, electronica and pop. The band won the 2006 Grammy Award for Best Pop Collaboration with Vocals for its second album, Demon Days. Their most recent album, The Fall, came out in 2010, but more music is expected in 2016. So many songs written about how good is for your health, a specific person being by your side and can't help but thing, that if that person decides to get out, for reasons that are never explained enough, how ridiculously easy, the medicine is turned to pure Cold Turkey. Yeah, inspired by true events! This is the track that got me into Gorillaz, I liked the melancholy that flew out of that obnoxious band naturally. Abstract with not specific meaning, just throwing misery and ugly looking cartoonish dudes, taking over your mood both on both audio and visual levels.